Kanye West's Sunday Service performance at Coachella reportedly attracted an astounding 50,000 attendees. Those fortunate enough to have caught the landmark Sunday morning performance on the festival grounds or on the live stream at home may have seen fellow Chicagoan Chance the Rapper dancing along to a classic house track. Kanye West and Chance the Rapper have been spending a lot of time together in recent months; the two also announced they were working on a joint project back in 2018. On Sunday, the two appeared to bond again over their Chicago roots, this time through the music of Cajmere. In the live stream clip posted to Reddit, Chance can be seen dancing to Cajmere's "Brighter Days" feat Dajae. Cajmere (real name Curtis Jones) is an artist of many aliases, but most will likely know him as Green Velvet. Jones took to Twitter on Sunday commenting "I luv me some Jesus" seemingly in acknowledgement of the performance of his old school classic. The original "Brighter Days" was released back in 1994, and based on Chance's reaction, the timeless track still doesn't fail to get a crowd moving. For listeners looking to hear the full version, listen to Cajmere's "Brighter Days" here. Moogfest's 2019 programming is an audiophile's dream. Celebrating its fifteenth anniversary, Moogfest boasts a prominent lineup of electronic and indie musicians for this year’s iteration including Wolfgang Voigt as GAS, Matthew Dear, Suzi Analogue, Mount Kimbie, Kimbra, Stephan Bodzin, Max Cooper and more. Since the first-annual event in 2004, Moogfest has largely become a popular gathering for both synth fanatics and forward-thinking music lovers. The festival's distinctive attraction is the commemoration of namesake Robert “Bob” Moog, inventor of the Moog synthesizer and a widely-recognized pioneer of electronic music. In keeping with Moog’s innovative spirit, festival organizers have put together a multi-disciplinary event featuring lectures, workshops and other immersive experiences that focus on the convergence of music, art and technology. Highlights for 2019’s programming include conversations with Martin Gore (the co-founder of Depeche Mode), wearable synth technology demonstrations by artist Lula Mebrahtu, and a panel of several performing artists speaking to the topic of female representation in electronic music. Spanning four-days and several venues across downtown Durham, Moogfest gives attendees a prime fusion of meaningful dialogue with carefree festival debauchery. Moogfest will take place from April 25 - April 28, 2019. More information found on the event website. Xilent has followed up his latest, "You Rise," with "The Darkness." The new single was released last week via Monstercat. The new track features a lovely female vocal, layered over a beautiful and entrancing melodic breakdown. At the drop the melodies continue, as Xilent brings the heavy yet uplifting and euphoric energy for which he is so well known. After sixteen bars, the energy is turned up to ten as another harder and more intense section with a stuttered and grimy bass line comes into play. This one is for fans of previous works like "Choose Me II" or "The Universe," but will undoubtedly also be well received by any heavy dubstep fan. Psyonix's popular video game Rocket League has also picked the track up on Rocket League Radio, the all-Monstercat in-game soundtrack/"radio station." Rocket League players will be happy to have Xilent's latest single playing while scoring those impossible goals off of flip resets. Monstercat has many other April releases on the way, including tracks from Dirty Audio, Slippy, Snavs, and Trivecta, to name a few. Production duo TWO LANES just released their latest single, "Common Ground" featuring vocals from Keiynan Lonsdale. The brotherly duo has been fairly busy lately in terms of new music, and it's paying off as they are solidifying a unique sound. "Common Ground" comes after the duo's latest, mid-tempo single "Back Down" featuring Kwesi, and makes up for a darker house vibe. The energy immediately starts building up as piano chords and soft atmospheres are introduced under Keiynan Lonsdale's smooth vocal work. The drop is dominated by an impactful synth melody, gritty basslines and vocal samples, making up for a classy and mature single. "For the song, it was decided to go for an ethereal, euphoric vibe," the two brothers said in a joint statement on the topic of "Common Ground." "After recording the vocals melodic elements were added, mainly recorded with analog synthesizers, which blend beautifully with Keiynan’s vocals. Listening back I think I speak for everyone when I say I can still feel the creative energy we wrote the song in." TWO LANES kicked off their project at the start of 2018. Combining their chemistry, similar musical backgrounds and classical training into classy productions, the duo had an impressive year, garnering millions of plays across streaming plastforms. "Common Ground" marks their third single for 2019, taken off their upcoming EP. David Guetta teamed up with Beatport to release The Road To Jack Back last month during Winter Music Conference (WMC) in Miami. Days ago, he went ahead and released the documentary short on his YouTube channel for easy accessibility. Telling his story first hand, Guetta chronicles his early days and the people and places that influenced his journey towards being the global phenomenon he is today. Last year, he announced his Jack Back alias alongside the release of his album 7. Jack Back is Guetta’s way of taking it back to his roots, to the deeper side - where it all started. "Since the album represents a full cycle to me I wanted to go back to the beginning of the cycle, where I’m coming from. These are actually the type of records that come more naturally to me than pop, because I’ve done this all my life. I wanted to create something very personal. I get excited by music that is part of a culture and that’s why I wanted to make this. There is no commercial approach to it, I’m doing it for the love of music." His story begins with him spending his early days in the underground Paris club scene while drawing inspiration from American DJs at the same time. He was first inspired to DJ by those on pirate radio which as he said was the radio for “rebels” back in his days. He slowly started teaching himself how to beat match in conjunction with the DJs on the radio, and spinning along on the single-turntable setup he had at home. Guetta started early by bringing greats from the American house music scene into the Parisian club scene. David Morales, Frankie Knuckles and Danny Tenaglia among others would come down to perform in Paris and through their talents, he would go on to hone his craft simultaneously. He also goes on to mention how he got acquainted with the wonder of Space Ibiza through these times and in 1995-1996 began to perform there. Things began to pick up for him when he took his breakout hit "Just A Little More Love" to Daft Punk and, impressed by his work, they set him up with Virgin Records. There was no looking back for him from there on. In the 15-minute mini doc, Guetta also goes on to say how after 30 years of DJing, at times it had began to feel like he was on autopilot and the happiness the music brought him was missing. That was the feeling his Jack Back alias brought back to him. Check out his last release under the Jack Back alias here. The most hotly anticipated electronic festival of the summer has just announced its second wave. Bassjackers, Tiesto, Yellow Claw, and more will take to the Tomorrowland stage in 2019. The lineup continues to remain an indicator of the hottest names within dance music. However, as with phase one of their lineup reveal, Tomorrowland did not hesitate to add some unexpected artists to its ranks. The full list of new additions includes Andhim, Bassjackers, Charly Lownoise & Mental Theo, Dave Clarke, Die Antwoord, Dynoro, La Fleur, Laidback Luke, MaRLo, Quintino, Rodhad, Roni Size, Seven Lions, Tiesto, Virgil Abloh and Yellow Claw. Separately, rumors continue to swirl regarding Swedish House Mafia, specifically whether or not the trio will headline the festival. Tomorrowland's top 1000 tracks were counted down on One World Radio in celebration of Tomorrowland's 15 years in action. Perhaps unsurprisingly, Swedish House Mafia's "One" took the top honor. Luckily, there will be even more announcements this week of new artists joining the Tomorrowland lineup, so be sure to stay tuned. More information can be found on Tomorrowland's official website here. 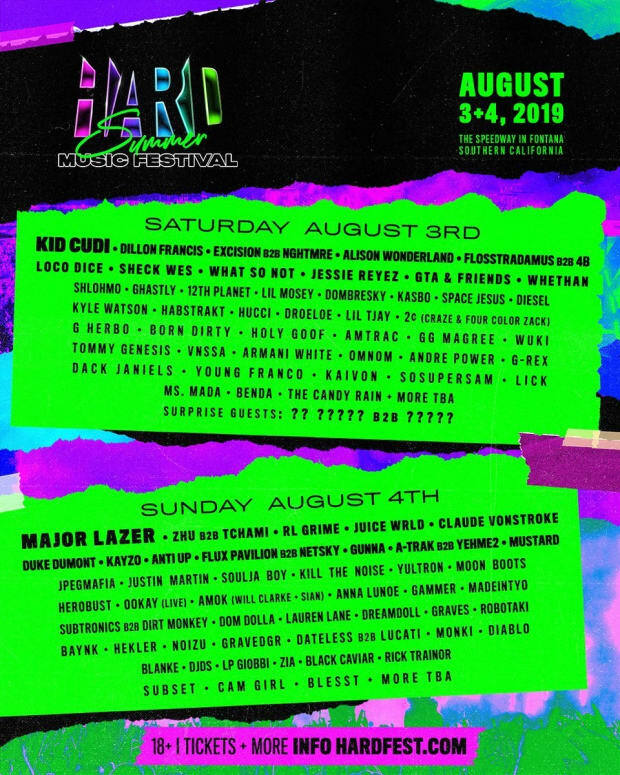 HARD Summer has announced their massive 2019 lineup in memorable fashion. The Fontana-based music festival is gearing up for its 12th year of action with Kid Cudi, Major Lazor, Dillon Francis, and many more of the biggest names in electronic music and hip-hop. HARD Summer's lineup reveals have consistently been among the most memorable for their creative delivery. This year, the lineup was revealed in a Saturday Night Live style spoof starring Dillon Francis and his piñata, Gerald. Overall, HARD Summer promises another strong year of electronic and hip-hop with many of the biggest names from both genres over the last year represented on the bill. Moreover, the festival continues to grow into its location at the Auto Club Speedway promising their most impressive production yet. The festival has established roots over the last three years at the Speedway, and will return again this year. For tickets and more information on HARD Summer visit their official website here. Check out their full 2019 festival flyer below. For those of you who love pop punk/rock and grew up in the late '90s/early '00s, alternative rock was another genre that you likely listened to just as much. And if you think about it, those two genres actually went hand in hand. With radio stations playing more alt rock than they do now, it was hard not to hear something by U2, The Fray or The All-American Rejects. To take us back to those good old days, we've put together a nostalgic playlist filled with the best remixes of some of our favorite alternative rock songs. You'll either love or hate them, but keep in mind that remixes are a tricky business. Although it was released in 1994, we just had to add Young Bombs' remix of Weezer's "Say It Ain't So" to the list. The last song on their self-titled debut album actually has two mixes that are both on the deluxe version. The first three million albums that were sold included the original mix, which had different drums, bass and no guitar feedback. The band liked the addition of the guitar feedback so much they replaced the original mix for the ever-popular one we hear today. Continuing with another song from a debut album, "In The End" is on Linkin Park's 2001 album, Hybrid Theory. Although the iconic rock band has many hits, "In The End" beat "One Step Closer" as their most-played song live. In fact, it's the second most played song of the decade according to Billboard. Interestingly enough the band's late lead vocalist, Chester Bennington, didn't actually like the song at first and didn't want it on the album. Jimmy Eat World's most commercially successful song, "The Middle," actually saved the band after they were dropped by Capitol Records. They paid out of pocket to record their fourth album, Bleed America - and in order to stay in the game they also had to take a different direction to their music. As reflected in the lyrics of "The Middle," it was a tough time for the band, but the success of the song put their name back in the spotlight and earned them a place on Billboard's charts. With another song that is a band's most played song live, "Can't Stop," has become a traditional opening song for the Red Hot Chili Peppers' performances. Since their album, By the Way, was released in 2002, it's been performed over 530 times. Just last month when they performed a special show at the Pyramids of Giza, the rock band played an intro jam right before getting into their first song of the night, which to no surprise, was "Can't Stop." With popular radio hits like "Mr. Brightside" and "Somebody Told Me," it's surprising to see that The Killers' 2006 hit, "When You Were Young," has been and currently is their only #1 song on Billboard's U.S. Modern Rock chart. Worldwide, it did just as well. To this day it's still their highest-charting single in both the UK and Australia. Although it didn't stay on the charts for as long as the other two, it's one of the rock band's most successful songs. If you liked our teaser or didn't find your favorite alt rock song, definitely check out the rest of our alternative rock remixes playlist! Kicking off their musical journey in their senior year of high school, Two Friends (real names Matt Halper and Eli Sones) honed their skills through an extensive variety of remixes, taking on the likes of artists such as Lana Del Rey, Alesso, and Tori Kelly. Through these remixes, Halper and Sones quickly demonstrated their highly versatile songwriting and production skills, and their careful addition of live instrumentation helps to create a unique and multi-faceted work of art on every piece of music they release. On April 19th, Two Friends made their Dim Mak debut with a stellar new dance-pop single titled “Dollar Menu.” In keeping with their signature upbeat and high-energy production, “Dollar Menu” showcases the duo hard at work, with singer/songwriter Dani Poppitt on the vocals. Stream or Download "Dollar Menu" today. Illenium announced on Twitter that his shows in London, Cologne, and Haag will have to be postponed due to a family emergency. The Denver-based DJ/producer made the announcement just before the weekend and promised refunds to all ticket holders as well as efforts to reschedule the shows as soon as possible. Later on, he posted a heartfelt note to fans apologizing for the cancellation and providing more insight into what happened. While in Paris, Illenium's girlfriend suffered a medical emergency and was hospitalized for five days. She did not have anyone available to stay with her, prompting Miller to cancel his shows to remain by her side. Illenium also went on to show his love to his fans for their support and explain that after a big scare his girlfriend is doing much better and was released from the hospital. He also let fans know that news about the reschedule will arrive soon. We wish her the best of luck and hope for a speedy recovery. At the end of the week, Slushii will embark on the Monster Energy Outbreak Tour and stop at 32 locations around the U.S. The Los Angeles DJ/producer is going to hook four special fans up with free tickets - and eligibility is easier than you think. To enter, all you need to do is comment what tour stop you would like to attend on the below Instagram post and tag three of your friends. Beforehand, though, make sure that you've followed both the @EDM and @SlushiiMusic accounts. The contest will run today, April 22nd through Thursday, April 25th, but new winners will be selected each week. On the Monster Energy Outbreak Tour, Slushii will be accompanied by none other than Bro Safari, Nitti Gritti and K?d. The tour will run just shy of two months, wrapping up with a show at Pier 17 in NYC on June 22nd. For more information on the Slushii Monster Energy Outbreak Tour, visit the official website. Snails has announced that the third iteration in his Sluggtopia concert series is coming to Red Rocks Amphitheatre on October 4th. Instead of his traditional solo headlining performance, he will join forces with Kill The Noise for a special Kill the Snails B2B headlining set. Alongside the duo, Snails (real name Frédérik Durand) is bringing out Rusko, Sullivan King, Krimer and Decadon for the 2019 edition of his headlining event. The first Sluggtopia took place in the fall of 2017 and has returned annually. Artists like NGHTMRE, Space Jesus, Cookie Monsta and Funtcase have appeared on previous iterations of the Canadian bass producer's curated event. In addition to Sluggtopia III, Snails is featured on Excision's Bass Canyon festival at the Gorge Amphitheatre. He is also slated to perform at Lollapalooza this year and will host a Gud Vibrations VS Slugz Music showcase alongside NGHTMRE and SLANDER. Presale tickets are on sale tomorrow with the code "sluggtopia3." You can get yours here. The tweet offers no suggestion of what lies in store, simply a link to mellomadeitright.com. When you navigate to the page you are redirected to a website with the text "You're invited to light it up" and a Spotify RSVP link. When you link your Spotify account to the page via the virtual RSVP, you're greeted with a message that says "thank you for RSVP'ing. See you 4.25." This page has spurred speculation about everything from a new album, festival, single, or more. At the time of writing, no information other than the initial link tweet has been revealed. It is worth noting that the page the link redirects users to is a Universal Music Group webpage, leading some to believe that this means the new music is on the way. Earlier this month, Marshmello released his collaboration with SOB X RBE, "Roll the Dice." In addition to the new single, a few days prior, he released the music video for his CHVRCHES collab. EDM/pop punk crossovers have been in high demand as of late, but Martin Garrix has cast an even wider net by bringing an emcee into the mix. In an interview with France's Fun Radio last month he revealed that among his 2019 releases will be a collaboration with a singer and a rapper. By the looks of things, he was talking about Fall Out Boy's Patrick Stump and Macklemore, respectively. That is, if each party's recent social media activity serves as an indicator. Martin Garrix and Macklemore have each posted images to their Facebook pages captioned "I got this feeling on a Summer day." A GIF with the same accompanying text was tweeted from the Fall Out Boy twitter account. As pointed out by Your EDM, "I got this feeling on a summer day" is the opening lyric of "I Love It" by Icona Pop. It remains to be seen whether the Swedish electropop duo are directly involved or the new song is otherwise a derivative work. Martin Garrix will resume touring with a May 3rd performance at the 2019 edition Landstreff Stavanger in Ålgård, Norway. In a new report from Billboard, it was revealed that artist representatives were informed that the on-sale date for tickets has been delayed. The news has led some to believe that Woodstock 50 may be at risk of being canceled. "There is currently a hold on the Woodstock 50 on-sale date. We are waiting on an official press statement from Woodstock 50 regarding updated announce, ticket pricing, and overall festival information. We will get this information to you as soon as we receive it." It appears the artist representatives are beginning to show their concern for the well-being of the festival as one unnamed agent told Billboard, "No one knows what the hell is going on but there is clearly a problem." Woodstock founder, Michael Lang, denounced the concerns as merely rumors and went on to explain the significance of the festival and provide assurance that his festival would still go on. Last month, the lineup for Woodstock 50 was released, featuring artists like The Killers, Chance The Rapper, Jay-Z, and more. The lineup received criticism from many online, including Kaskade. At the time of writing, a new on-sale date for tickets has not yet been announced. Woodstock 50 Anniversary will be held August 16th-18th, 2019 at Watkins Glen International Speedway. To learn more about the festival and join the mailing list for tickets, head over to their official website. As the world remembers the day we lost one of our brightest stars, the BBC aired the Netflix documentary in honor of the late Avicii. Aired Saturday, exactly one year after his death, the documentary gives viewers a look into the life of one of EDM's all-time bests. Avicii: True Stories is Tim Bergling’s own story, told from the inside. Made from his extensive personal and family archive and behind the scenes footage, the film is an unparalleled insight into his life - from his early days posting tracks online and his first gigs, through to global chart-topping success that saw him play to hundreds and thousands of fans internationally. Unreleased music from the late Avicii (real name Tim Bergling) will be released on an album simply titled Tim. His collaboration with "Wake Me Up" singer Aloe Blacc, "SOS" was released as the first single from the posthumous album. You can watch the full Avicii: True Stories documentary here. At the time of writing, this documentary player on the BBC is only available to viewers in the UK. Excision, the man behind the world's biggest bass music festival, Lost Lands, has been rolling out artist announcements over the course of the past week. In the most recent announcement post for performer Whipped Cream, it was revealed that the full lineup will drop next week. In a letter to fans last month, Excision (real name Jeff Abel) detailed the changes to the third year of the prehistoric-themed bass music festival. Included are improvements to the water supply, camping, and late-night soundcamps. In addition to Lost Lands, Excision is also hosting a west coast festival at the Gorge Amphitheater, called Bass Canyon, featuring performances from himself, Flux Pavilion, Zomboy, Downlink, and more. Lost Lands 2019 takes place September 27-29th at Legend Valley in Thornville, Ohio. Tickets are on sale now. You can purchase yours here. Austrian rising star LUM!X has joined forces with the legendary Italian DJ Gabry Ponte (known for the 1998 hit "Blue (Da Ba Dee)" with his band Eiffel 65) for the massive, festival-ready future-bounce track titled “Monster.” Combining lush vocal melodies and a sophisticated bass line with a burst of booming beats and eclectic synth chords, "Monster" is a true DJ’s favorite and a major milestone for the Austrian artist currently working his way to the top. Both LUM!X and Gabry Ponte are widely recognized for crafting exquisite dance gems with infectious rhythms and tantalizing melodic hooks. “Monster” is the perfect blend of these distinctly recognizable sounds, boasting a pleasing, upbeat vibe that is perfectly accentuated by the catchy singalong chorus that was meticulously designed to drive audiences around the world into a dance-induced frenzy. Stream or Download your copy of "Monster" today. Fisher isn’t the only tech house artist making international headway. Though the exuberant Aussie is an EDM phenomenon, there are lesser known tech house Australian artists climbing their way towards global fandom. Dom Dolla is one of them. The Melbourne-based producer makes his mark with deep, dark, rolling basslines, and beats that have dancefloors grooving into the night. From smoky club tunes like “Take It” to summer house anthems like “Define,” Dom’s sound varies across the house music spectrum. This week, Dom Dolla made his debut on Beats 1’s weekly radio show One Mix. With tunes from Airwolf, Kyle Watson, Jay Robinson, plus unreleased Dom Dolla music, it’s an hour of house music that lets listeners know what the dom Dolla sound is all about. Listen here, exclusively on Apple Music. The Australian producer had much to share about his musical affinities and experiences. Like the one time where he missed a flight and an Uber driver drove him over 6 hours to get him to his show on time. Read on for more, including Dom Dolla’s favorite throwback track, dream collaborator, and perfect sunset song. Dom Dolla: Growing up in the Northern Territory, I had little to no experience when it came to dance music as a teen. Everything I was exposed to back then was folk or roots music oriented. I moved to Melbourne around 15 years old and soon found myself sneaking into clubs every weekend. In those days I was digging through Myspace and music blogs pretty heavily, which probably would have made my first gig experience a Classixx show at Sorry Grandma; I had the absolute time of my life. Both mum and dad got the VIP treatment at a recent gig I had at the Forum in Melbourne. My face was sore from smiling that day; the photos are absolutely priceless. I still dig pretty deep through SoundCloud, listening to live sets and mixes. But I’d say my preference would definitely be harassing my friends for their new productions via Facebook Messenger haha. “Love Inc” by Booka Shade. The legend himself Juzzy Martin, he was nice enough to let me sample him on an upcoming record of mine. I’m getting closer! My housemate’s USB Condenser Mic. I definitely need to return it to him one day soon. That all DJs do is party. Some of the hardest working and dedicated people I know are DJs and producers. I’m not one of them, but that’s beside the point. On the road I have to pick my battles carefully, but when I’m at home; there’s nothing I enjoy more than a Pint and a Parma with my mates on Smith Street in Collingwood. I was absolutely blown away by an audience I performed to in South Carolina recently. But I’d definitely say that Melbourne is getting stronger and stronger every year. It’s always been good, but it’s getting ridiculous. Hard-style will not reach the mainstream? Make it a goal to replicate and reverse engineer as many of your favorite tracks as possible. You might not get them sounding identical, but you'll get invaluable practice in sound design and song structure. You can then use your new arsenal of knowledge to write some great originals. Also, learn to master the gear you have. I see too many young producers blowing all their cash on expensive plugins and hardware - It’s the chef, not the kitchen! On my most recent US tour, my manager and I went a little wild in Las Vegas the night before an important show in Santa Barbara. We ended up sleeping through our flight the next day. As regretful, hung over and stressed as we were, a legendary Uber driver ended up driving us 6.5 hours across state lines for dirt cheap. Not being able to believe our luck, we put him up in a hotel and insisted he come to the show with us. He quote “had the night of his life” and we’ve been friends ever since. Shout out to my boy Tim. “La Vie En Rse” by Louis Armstrong. A remix I did for my friends Flight Facilities of their track “Arty Boy.” I had no idea how well that would translate when I wrote it, thanks for the great stems lads. I bought Rooty by Basement Jaxx as a 9-year-old in Bali. Not sure if it was a legitimate copy or not, but gee I gave that album a rinsing. Love Henry Krinkle’s “Stay” but I think the Justin Martin remix tips it over the edge, such a great mix. “Highway to Hell “ by ACDC. Just kidding, that’s one track I’ll let my mates choose. I’ve done enough DJing, haha. What's the perfect sunset track? If the 12 months since Avicii's passing have proven anything, it's that his impact on the world of EDM will not be forgotten. One year ago today the Swedish superstar DJ/producer died at the age of 28 in Muscat, Oman. Even in death, his influence is undeniable. Avicii (real name Tim Bergling) began to make a name for himself on an international level with the 2011 release of "Seek Bromance" (the vocal edit of "Bromance," which came out the previous year). Shortly thereafter he delivered "Levels," the song which propelled him into mainstream consciousness. Two years later, Bergling debuted a then-controversial single titled "Wake Me Up" at Ultra Music Festival in Miami. The song, which later appeared on his album True of the same year, featured Aloe Blacc and bluegrass instrumentals. Although its reception wasn't entirely positive, Bergling proved a trailblazer when EDM recording artists began following suit in droves. Despite his success, Bergling's acute anxiety and resulting substance abuse issues became hard to ignore. After cancelling two tours part of the way through, he announced his retirement from live performance in spring 2016. An article in Swedish newspaper Dagens Nyheter chronicled his uphill climb back to health, and the resulting reinvigoration of his studio work. Tragedy struck unexpectedly. Tim Bergling was found deceased Muscat. His family later issued a statement revealing that his passing was due to suspected suicide. Why he would take his own life after making so much progress in his personal and professional life remains a mystery to many and continues to haunt his friends and loved ones. Avicii's family have announced plans to launch an initiative called the Tim Bergling Foundation that will support organizations with a focus on suicide prevention, mental health awareness and similar causes. This year, his final songs will be released as part of an album titled Tim - the lead single of which, "SOS," came out last week.